The pressure tanks fabrication company HOLLOWAY AMERICA receives honor from 3M for crafting the first Zeta Plus™ Encapsulated Multi-Round System. 3M presented HOLLOWAY AMERICA the Vendor Achievement Award for custom steel fabrication of the Zeta Plus Encapsulated Multi-Round System. Honors like this award from 3M stem from the meticulous care our craftsmen put into every custom fabrication we deliver. 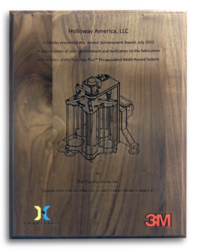 3M Purification Inc. recently presented HOLLOWAY AMERICA, best known for finely crafted pressure tanks and tank components, with the 3M Vendor Achievement Award. 3M awarded HOLLOWAY the honor for fabricating the first-ever Zeta Plus™ Encapsulated Multi-Round System, a rotating filter press for clarification of bioprocess and biological fluids. The system is currently helping Merck produce an insulin derivative that is used worldwide. To thank them for their custom steel fabrication on the new system, 3M Marketing Manager Paul Lubas addressed HOLLOWAY's employees during a brief ceremony at the HOLLOWAY AMERICA fabrication center in Springfield, MO. To emphasize 3M's gratitude, Lubas read the engraved walnut plaque aloud: "HOLLOWAY AMERICA is hereby presented this Vendor Achievement Award, July 2012, in appreciation of your commitment and dedication to the fabrication and delivery of the first Zeta Plus™ Encapsulated Multi-Round System." Some may not associate pressure tanks and fabrication with saving lives, but Lubas noted that such work can make a critical impact around the globe. "For those of you who don't know," he told the crowd of craftsmen, "that system actually went to a Merck production facility in Elkton, Virginia. What they do there is make an insulin derivative. So while you guys do a lot of steel bending and steel grinding, I just want to let you know that the work you do actually goes to improve and, in some cases, save the lives of a lot of people in the world." HOLLOWAY President Pat McKee also thanked the employees for their dedication to quality. McKee referenced his 35 years experience in the custom tank components and pressure vessels industry to acknowledge the unsurpassed quality this group of fabricators produces: "I've been doing this since 1976, and I have never seen more beautiful work come out of a shop than this shop here. So everybody, 3M and all of our other customers, thanks you." McKee then described how the Zeta Plus™ Encapsulated Multi-Round System resulted from collaboration between 3M and HOLLOWAY AMERICA. The rotating multiple-round filter press system was built to meet the strict standards of both companies. HOLLOWAY built and assembled the sophisticated system, complete with controls, in its fabrication and CNC machine facility in Springfield, Missouri. Asked about receiving an award for his company's role in building the system, McKee focused on his employees: "We're honored that 3M wanted to recognize our men and women for their fine work. I couldn't be any prouder of our people. I know this is for them and that awards like this result from the incredible care each and every HOLLOWAY employee puts into crafting every product we deliver. Our company's reputation is built on their dedication to excellence." For more information about custom steel fabrication services, contact HOLLOWAY AMERICA at 417.863.0077 or by email at info(at)HollowayAmerica(dot)com.